They are the long awaited (if not anticipated) OLYMPUS E-P3, OLYMPUS E-PL3 and OLYMPUS E-PM1 & 2 Zuikos, the Olympus MZ12mm and Olympus MZ45mm lenses. For the sake of reading ease, I have decided to break this news to you by breaking it into 4 parts. I am covering or rather duplicating what was sent to me from Olympus’s Press Releases as I am in not in the position to comment or review the camera until I tested it. Let’s Start with Olympus E-P3. *Among interchangeable lens type digital cameras available as of June 30, 2011. Focusing time between infinite and 1 meter, measured at the 35mm (70mm at 35mm camera equivalent) of an M.ZUIKO DIGITAL 14-42mm f3.5-5.6 II R lens mounted on the OLYMPUS PEN E-P3 camera. According to Olumpus in-house test conditions. The OLYMPUS PEN E-P3 is an interchangeable lens type digital camera that conforms to the Micro Four Thirds System standard. Designed as the new flagship of the PEN series of new generation system cameras, the E-P3 is aimed at camera buffs looking for a camera that combines traditional style and functionality with advanced digital capabilities and top-notch performance. Like previous models in the PEN series, the E-P3’s remarkably compact design has been made possible by the elimination of the quick-return mirror, while maintaining key SLR advantages such as high performance and high image quality. In fact, the E-P3 easily outperforms any other camera on the market with its powerful new FAST AF system. When combined with a lens incorporating the new MSC (Movie & Still Compatible) mechanism, which increases the speed and decreases the noise of autofocusing, the combination of AF’s double-speed sensor drive and the double-speed detection processing allows the E-P3 to achieve the world’s highest AF speed. At the same time, better-than-ever image quality is made possible by the new 12.3-megapixel High Speed Live MOS Sensor with 1080i full HD movie compatibility and the new TruePic VI image processing engine. High-sensitivity shooting at ISO12800 is also possible. Simplicity and ease of use have always been the hallmark of the PEN series, and the E-P3 is no exception. In addition to its convenient Main and Sub dials, the new E-P3 is equipped with a 3.0-inch, 610,000-dot OLED display whose excellent colour reproduction and touchscreen panel provide the superior display capability and intuitive operability needed for creative image composition. The user interface’s high-definition text and graphics support attractive graphical menus that are easy to see, easy to understand, and easy to use. 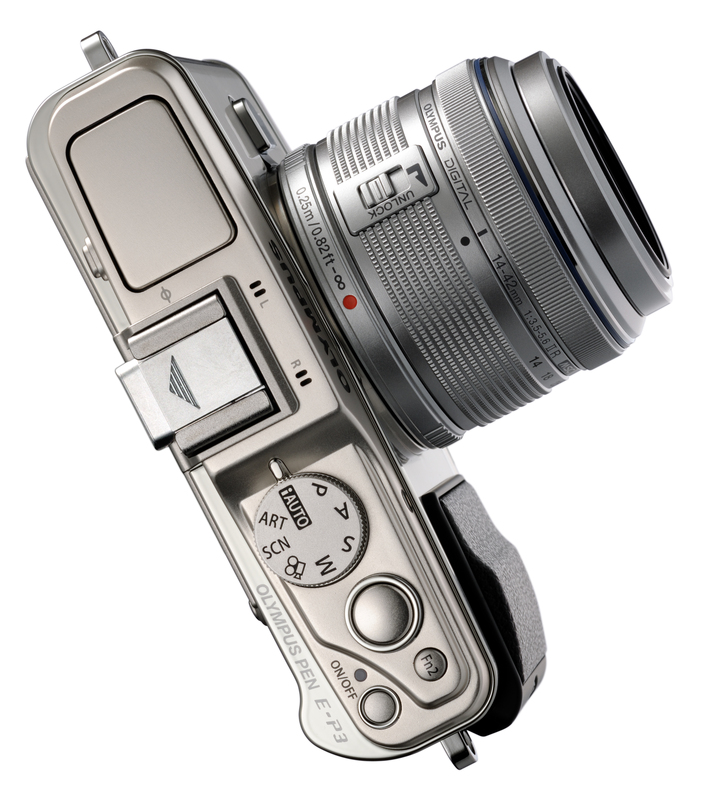 Recreating the timeless style of the classic Olympus PEN series, the E-P3’s advanced performance is housed in an elegant, retro design with a durable metallic finish that exudes quality, reliability, and performance. A work of art in itself, the E-P3 features a new detachable grip, giving the user the opportunity to choose a grip most suitable to his or her shooting style; for example, an optional large grip can be used in place of the provided standard grip or the grip can simply be detached for a simpler look. 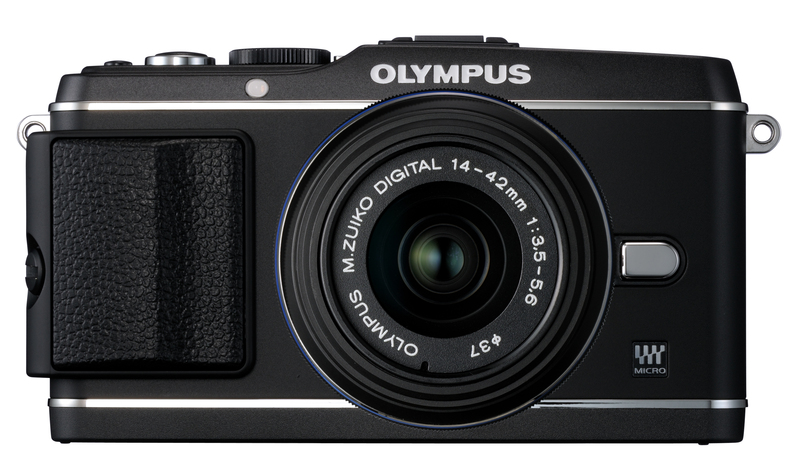 Available in a choice of three colours — Silver, Black and White — the OLYMPUS PEN E-P3 brings a new level of performance to the world’s most stylish line of cameras. Another example of Olympus’s commitment to relentlessly enhancing and advancing its line of new generation system cameras, this new camera is certain to expand today’s fast growing market for lens interchangeable type digital cameras. One of the primary areasOlympus concentrated on when developing the E-P3 was the AF (autofocusing) system. The result is the world’s highest AF speed, faster than any traditional SLR with mirrors. Because the new FAST AF system drives the Live MOS Sensor at double the previous speed (120 fps), image signals can be obtained more quickly than with previous systems. The speed of the AF computations that generate the contrast signal from the image signal in order to determine the degree of focusing has also been doubled. The advantages made possible by these improvements are further enhanced by the increase in the speed of communication for controlling the lens motion and the synergy of the MSC (Movie & Still Compatible) mechanism which facilitates fast, quiet movement of the AF system in the lens, as well as faster response time from shutter release to the start-up of AF system. Together, all of these improvements have resulted in imager AF speed that is almost three times faster than before, making it by far the world’s fastest. *Among interchangeable lens type digital cameras available as of June 30, 2011. According to our in-house test conditions, with an M.ZUIKO DIGITAL 14-42mm f3.5-5.6 II R lens mounted on the OLYMPUS PEN E-P3 camera, with the lens at the infinity position, and with the subject at a distance of 1 meter and the lens focal length at 35mm (70mm at 35mm camera equivalent), AF calculation time is the time between when the shutter button is pressed and the start of exposure, focus to shutter release. The number of focus selection areas has been increased from 11 to 35, enabling detailed, pinpoint AF across a wider area than before. To capture a moving subject accurately, the group area selection can apply AF to a limited region compose of 3 vertical and 3 horizontal areas. The full-time AF function keeps the Live View image focused even when the release button is not pressed. As the camera always remains focused on whatever subject it is pointed at, S-AF shooting, which is initiated by a half-press of the shutter release button, can be engaged more quickly. The functionality of the tracking AF that automatically tracks and focuses on a moving subject has been improved. Unlike the previous method, which tracked the feature points of the luminance signal and tended to lose the tracked subject when the shapes of the feature points changed, the new system used in the E-P3 employs an advanced detection method that uses the chroma signal and face detection data as well as the luminance signal, allowing it to continue focusing on the subject even when its shape changes or temporarily disappears during tracking. 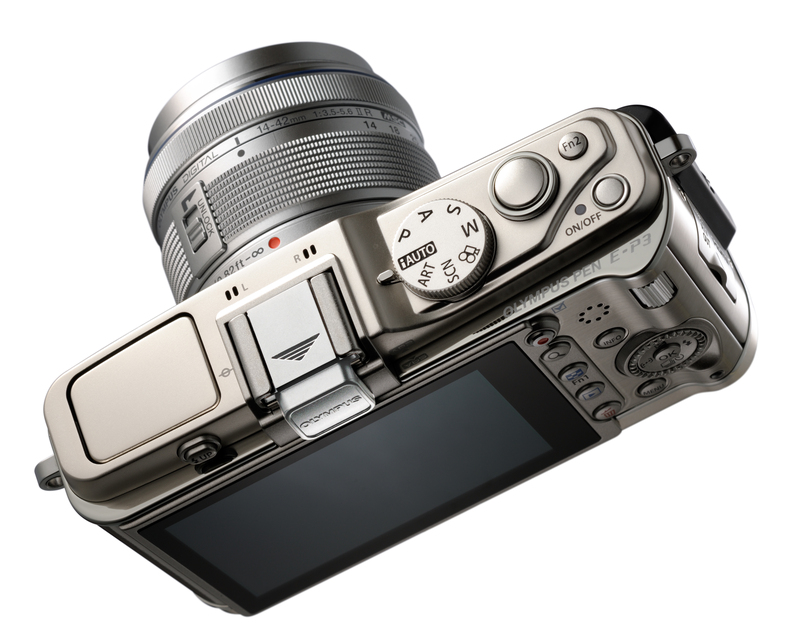 The E-P3 is the first PEN series camera incorporating an AF illuminator to support autofocusing in low light. The light covers a range of about 3 metres and can be switched ON/OFF. The iris detection AF introduced on the E-PL2 has been made more versatile, allowing users to choose from “OFF”, “nearer-eye priority”, “left-eye priority” and “right-eye priority”. This facility is provided because the orientation of the face in portrait shooting is fixed so the focused eye is also usually fixed. Some photographers may prefer to be able to deliberately focus on the farther eye instead. These selections can be activated directly with a button. – View images improves image reproduction, reducing jaggy oblique lines and other noise. Maximum sensitivity has also been boosted to as high as ISO12800. The E-P3 incorporates the newly developed TruePic VI image processing engine. It achieves both improvement of the image processing quality as well as reduction of processing time. In addition to inheriting the Fine Detail processing that provided the E-5, our DSLR flagship, with extremely high resolution, the E-P3 incorporates Real Colour Technology to improve reproduction of colours that are hard to be reproduced accurately. This technology improves the reproduction and gradation expressions of previously hard-to-reproduce colours such as emerald green, yellow, thereby also increasing the 3D feeling of the image. The Shadow Adjustment Technology (SAT) used to improve gradations in dark areas when the Gradation Auto is set (manually, iAUTO, etc.) has been further enhanced to provide optimal performance even under extreme high contrast conditions such as shooting against the light. As a result, this new ASAT technology produces a natural image like that seen by the naked eye, optimizing the brightness of the under-lit area with respect to the highlight area to prevent both over- and under-exposure. The E-P3 incorporates the MPEG4 (H.264) movie codec to record AVCHD-format movies that can be played back on living-room AV components such as HDTVs and Blu-ray players. The inter-frame flicker noise reduction function reduces the flickering noise in motion JPEG movies and Live View display, as well as in AVCHD movies. The Art Engine that handles image processing for the Art Filters has been further refined to speed up frame rates in Live View, provide faster response after shooting, as well as making possible such new functions as Art Filter bracketing and 3D Art Filter shooting. The result is a sophisticated Art Filter system that’s easier to use, as well as more flexible and creative. As the previous image processing engines were designed based on viewfinder shooting, a single image processing core processed the recorded image and Live View image in sequence and was not capable of outputting the Live View image until the recorded image had been processed. The TruePic VI engine newly designed exclusively for the Micro Four Thirds System incorporates a Live View-dedicated image processing core so that it can output the Live View image during recorded image processing. This has dramatically reduced the time it takes to return to Live View after shooting, enabling faster response during sequential shooting and rapid SLR-style shooting. The 3.0-inch OLED (organic EL) display used as the rear-panel monitor of the E-P3 can display video data equivalent to VGA (approx. 920,000 dots) using a special layout of 610,000 dots. With the ability to reproduce tight black and vivid colours thanks to OLED’s wide colour reproduction characteristic, this display provides a wide angle of view, rich colour expression and high resolution, all of which are sure to enhance the joy of photography. With two colour tone options of “VIVID” and “NATURAL”, the user can take advantage of the properties of the OLED for a vivid picture, or reproduce a tone similar to the LCD display used on PC monitors. The monitor also features an electrostatic capacitance type touchscreen control in addition to the traditional button and dial control facilities. This allows the following operations to be performed simply by touching the panel surface. Of course, these operations are also available using conventional buttons and dials, as well as via the touchscreen panel, which can also be switched OFF if not needed. Long-term durability is assured by solid construction with the space between the cover and the panel sealed with optical adhesive that suppresses reflections due to airspace. The screen itself is treated with Anti-Fingerprint coating to minimize the diffused reflections due to finger oil. The result is excellent visibility, indoors and out. 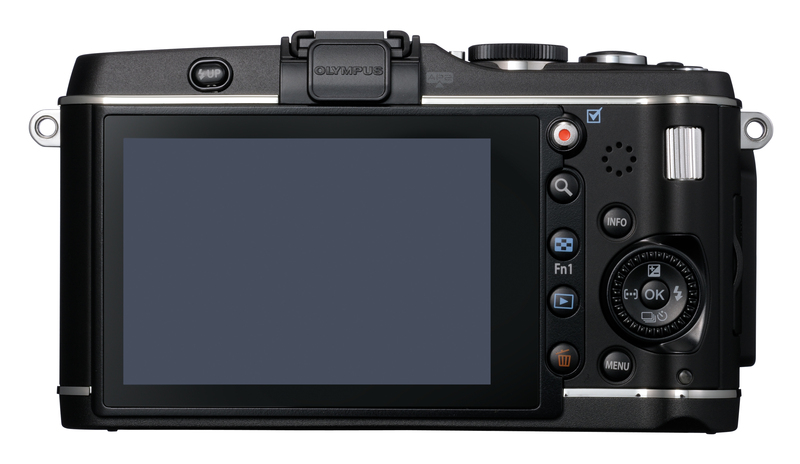 The E-P3’s user interface has been completely redesigned. The font and graphics used in the menus offer improved visibility and quality to render elegant graphical menus that are 7 attractive, easy to see, easy to understand, and easy to use. In spite of the built-in flash and accessory port, the E-P3 recreates the sophisticated design of original PEN, retaining the simple, elegant profile made popular by the E-P1. The full-metal body includes metallic rear panel button controls and effectively balances ruggedness and light weight. The mode dial has a metallic pear-skin finish, and metallic dials and buttons, particularly the power button and blue power indicator feel solid and durable. The cool touch of metal in the palm of hand, the comfortable weight, and excellent balance will satisfy any lover of cameras. To better satisfy the demands of camera buffs, the E-P3 features a detachable grip that can be changed or removed to suit the shooting style of each user. The user can detach the provided standard grip and replace with the optional MCG-2 Camera Grip to hold the camera more firmly or just use the camera without a grip for a simpler look. Ever since the E-30 was introduced (December 2008), Olympushas been supporting the creativity of photographers by incorporating easy-to-use Art Filters in its lens interchangeable type digital cameras. The new E-P3 incorporates all ten Art Filters, as well as all the Art Filter variations and Art Effects developed by Olympus. Enhances colours, making them stronger and more vivid to create high-impact images with a pop-art feel. Gives images a dream-like quality that creates a romantic and mystical atmosphere. Subdues highlights and shadows to assure muted colour tonalities that evoke a mood of reflection and nostalgia. Brightens the image to reveal more shadow detail and evoke a lighter mood. Recreates the classic grainy look and tonality of black & white photography, imparting a 8 dramatic feel to images. Adjusts colour and reduces brightness at the periphery, recreating the distinctive look of photos taken with a pinhole camera. Creates the look of a miniature diorama by enhancing colour and contrast, and blurring the periphery to distort distance perception. Simulates the unexpected colour transpositions and look that result when negative film is processed with a positive film emulsion, or vice versa. Gives images the look of a vintage sepia-tone print, with gentle contrast and well-defined shadows. Represents real space in a more imaginary way by applying unrealistic tones of light and darkness based on local changes in contrast. *1 The number and types of variations and the applicable effect functions are variable between Art Filters. *2 When a movie is recorded using an Art Filter, the number of frames and presence/absence of audio and Art Effect are variable depending on the type of the Art Filter. The Art Filter bracketing function can generate multiple pictures with different Art Filters with a single shot, making it possible to experiment with several different photographic effects at the same time. In addition to the Art Filters, this function can also be used to select multiple picture modes including Vivid, Natural, Flat and Portrait. *3 , allowing users to enjoy full HD Art Filtered movies on a large-screen TV with family or friends. *3 Not available with the Starlight effect. 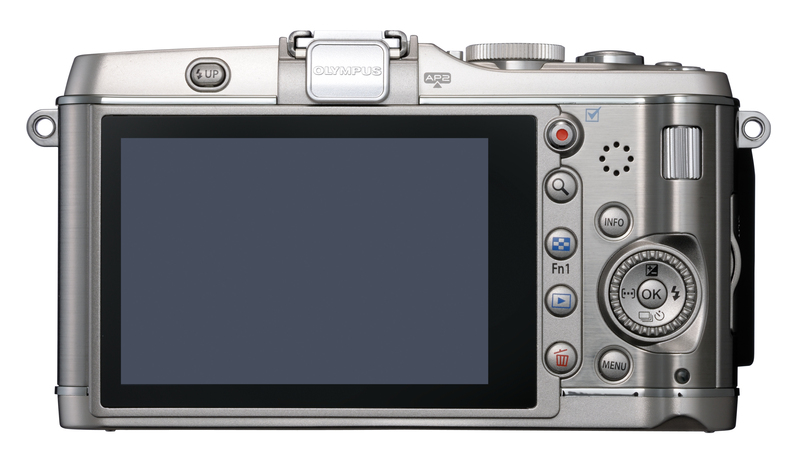 Since the E-PL1 (launched on March 2010), Olympus has been incorporating a new user interface called the Live Guide. Designed for users who do not have expert knowledge of photography but want to have creative control over their pictures, Live Guide lets users shoot the pictures they want by selecting an icon and operating a slide bar to control the major factors for the SLR photography including “colour vividness”, “colour balance”, “image brightness”, “depth of field (blur background)” and “subject in motion”. The names of these factors are expressed in daily, easy-to-understand languages without any jargon. With the new E-P3, the Live Guide function, which previously was only available in iAUTO mode, can now be accessed with the Fn button in any of the P/S/A/M exposure modes. The touchscreen panel on the Live View monitor makes it possible to recall the Live Guide and operate the slide bar in a more intuitive manner. *1, which can be easily played back and edited on a PC, the new E-P3 can record movies in both full HD (AVCHD: 1920 x 1080/59.94i) and HD (AVCHD: 1280 x 720/59.94i) movie formats*2 for extended recording and playback on a large-screen high-definition TV set. *1 Recording capacity per one file is limited up to approx. 2 GB; max. recording time is approx. 7 minutes. *2 Recording capacity per one file is limited up to approx. 4 GB; max. recording time is approx. 22 min. in full HD mode, approx. 29 min. in HD mode. Image sensor output is approx. 30 fps. Olympus’s extensive experience in the field of IC recorders has made it possible to develop high-quality recording systems that offer extreme fidelity to the original sound and full presence. The camera body incorporates stereo microphones compatible with the linear PCM format (Motion JPEG mode) for high audio quality without compression, and Dolby Digital format (AVCHD mode). When high-quality external stereo microphones such as the SEMA-1 Microphone Set 1 (optional) is attached to the accessory port, audio input is switched automatically to the external stereo microphones facilitating higher quality stereo sound recording and effectively reducing wind noise. The E-P3 incorporates a GN10 (ISO200) electronic flash with built-in TTL metering. When the FL-50R, FL-36R and/or FL-300R external flashes are used, wireless control of multiple flashes is possible without an external commander. Firing mode and firing intensity settings for each of up to three groups and a built-in flash can be set easily on the LCD panel on the rear of the body. The built-in flash intensity can be set between 1/1 and 1/64 in 1-step increments. The E-P3 incorporates an image stabilization mechanism based on image sensor shifting so handheld shooting with reduced image blurs is possible even in low-light scenes or telephoto shooting. This mechanism shifts the image sensor unit instantaneously and precisely, and is built into the camera body so image stabilization is possible with any lens, including an M.ZUIKO DIGITAL lens as well as an old lens mounted using an adapter if the focal length is input manually. Furthermore, an electronic movie image stabilization function with multi-motion compatibility is incorporated to compensate for image blurs due to ordinary camera shakes to those caused by respiration and walking. As an extension of the brightness adjustment of the Live Guide, functions for individual adjustment of the brightness of only in the “bright section” or “dark section” is added to the exposure compensation function to enable adjustments equivalent to those available with the Live Guide even when this is not activated. These functions make easy the pictures with tight black with a taste of reversal film or advanced expressions for enhancing or eliminating the gradations of white of snow. For added convenience, more functions can be assigned to the Fn button. Conventionally, only one Fn button is provided, but the new E-P3 is equipped two Fn buttons, allowing you to assign a different frequently used function to each button. If two seconds pass without any operations during menu display, the camera enters the explanation display mode, popping up an explanation of each menu item whenever it is changed. As the user can find out what each function is used for and how it is used without the instruction manual, the explanation display is a big help for users who are not familiar with the camera or who have forgotten how to do some operations. Once the user is accustomed to the camera, pressing the INFO button turns the pop-up display off. Whenever an explanation becomes necessary, press the INFO button to start up the display again. If dirt or dust penetrating the camera body during lens replacement attaches to the low-pass filter or image sensor, it will show up in the image. This problem is particularly important with the E-P3 because its mirrorless structure does not cover the image sensor with the shutter screen.Olympushas been aware of the critical nature of this problem since the beginning of development of lens interchangeable type digital SLR cameras and solved it properly. When the camera is turned on, the SSWF (Super-Sonic Wave Filter) installed in front of the image sensor is activated to blast dust away from the image sensor with supersonic vibrations. The tremendous power of the supersonic waves manifests reliable dust reduction performance by even removing dust that cannot be removed merely by shaking the image sensor or dust that is attached by intermolecular force and cannot be removed by merely discharging static electricity. The 3D Photo function has been newly added to the scene modes. After the first shot, simply sliding the camera following the guide takes the second shot and records a 3D file (MPO format). The recorded image can be played with powerful 3D playback on a 3D function-compatible PC or TV. Using the dual axis sensor incorporated in the camera, a 2-direction level gauge corresponding to vertical and horizontal directions can be displayed on the Live View monitor. The FL-300R is a compact, lightweight external flash with a slim profile that matches any PEN camera. Featuring bounce and remote control capabilities, this flash achieves a GN (Guide Number) of 28 (ISO200-m) despite its compact, pocket-sized design. A tilting mechanism with max. 60° upward and 30° downward capability enables bounce flashing so that a soft expression with high-quality and deeper feelings can be enjoyed easily. Close-up flash shooting impossible with the camera’s built-in flash is also possible using the FL-300R. The FL-300R is also compatible with remote flashing. The firing intensities of up to two groups of flashes can be controlled independently with wireless control. The flash is equipped with a built-in wide panel, which can be used to cover an ultra-wide angle with a focal length of 9mm (equivalent to 18mm of 35mm cameras). The M.ZUIKO DIGITAL 14-42mm f3.5-5.6 II R is the new standard lens for the PEN series cameras, launched at the same time as the E-P3. It has newly been designed to match the new line of PEN series while retaining the high performance of the previous M.ZUIKO DIGITAL 14-42mm f3.5-5.6 II standard zoom lens. It incorporates the MSC mechanism and implements fast, quiet AF using the inner focus method. Despite the compact size and light weight, it is applicable in a wide range from street shooting to portrait shooting. These are the detachable camera grips optionally available for the E-P3. The MCG-1 is the same grip as the one standard as provided with the camera body, while the MCG-2 is a large-sized grip that can be interchanged easily with the standard type. The large grip will improve holding of the camera when the user needs to hold it more firmly, for example when using a telephoto lens. 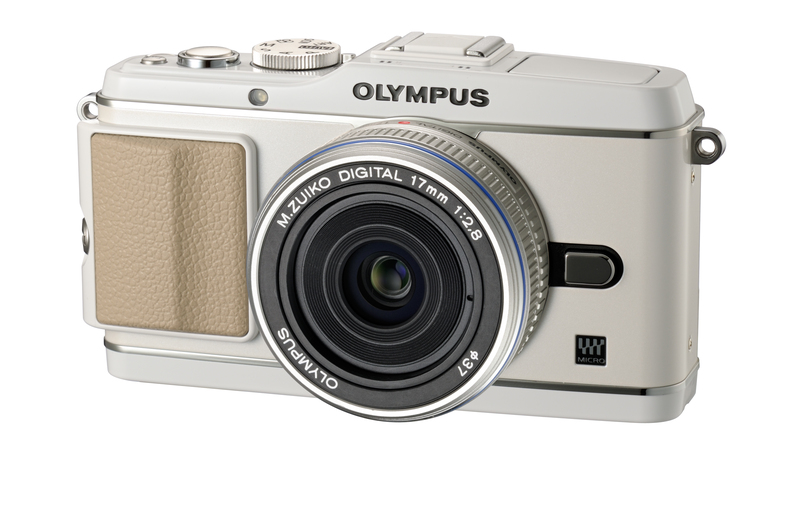 The CS-29FBC is a genuine leather full cover case designed exclusively for the OLYMPUS PEN E-P3. It can accommodate the camera together with the M.ZUIKO DIGITAL 14-42mm f3.5-5.6 IIR standard zoom lens, the M.ZUIKO DIGITAL ED 9-18mm f4.0-5.6 wide-angle zoom lens or the M.ZUIKO DIGITAL 17mm f2.8, M.ZUIKO DIGITAL ED 12mm f2.0 or M.ZUIKO DIGITAL 45mm f1.8 thin pancake lens mounted. Designed to enable quick shooting without taking the camera out of the case, it provides reliable protection for the lens and camera body. 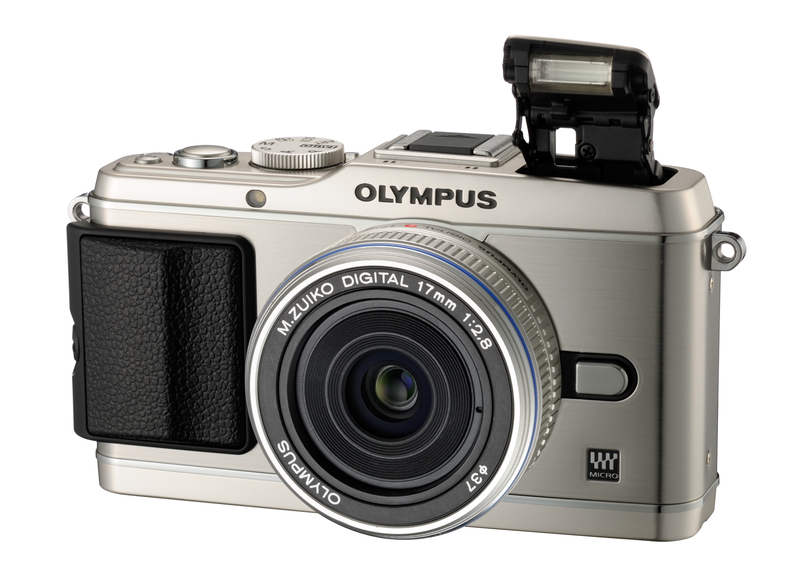 The CS-30B is a genuine leather body jacket designed exclusively for the OLYMPUS PEN E-P3. It protects the sensitive parts of the camera body without detracting from its design. In addition to the practical aspect of camera body protection, the body jacket’s genuine leather and rugged construction exude a sense of both traditional craftsmanship and contemporary styling. 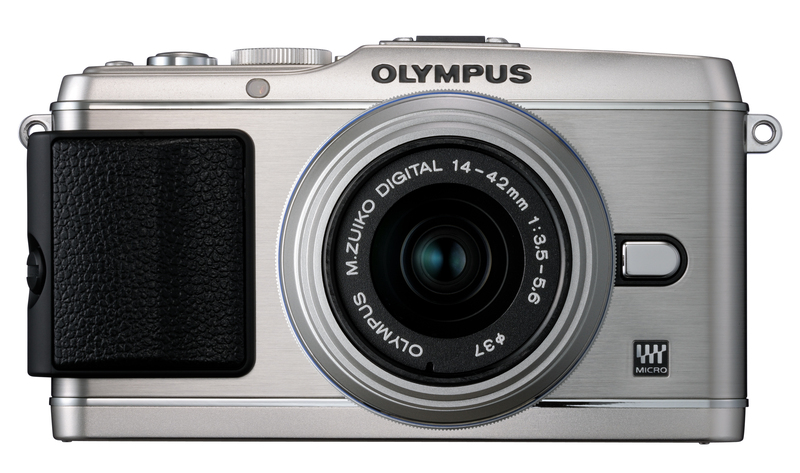 The ideal complement for the OLYMPUS PEN E-P3, this jacket makes the camera even more fun to carry. Naturally, shooting and playback is possible while viewing the rear-panel LCD without taking the camera out of the body jacket. The CSS-S109LLII is a genuine leather shoulder strap with an increased length adjustment range that makes it even more convenient than the CSS-S109LL shoulder strap. The strap length can now be made short enough to use as a neck strap and long enough to sling over the shoulder and across the chest. The colour can be coordinated with the body jacket. The CSS-S114 (launched on January 2011) is a beige-coloured shoulder strap that’s both fashionable and practical. Now available in brown and green as well, it features a warm, natural design that complements any of the new OLYMPUS PEN models, including the E-P3, E-PL3 and E-PM1. Made of luxuriously textured fabric, this strap can also be customized by attaching pin badges or other items. The length is about 138 cm, the optimum length to sling the camera over a woman’s shoulder and across her chest. The following body/lens colour combinations are available. 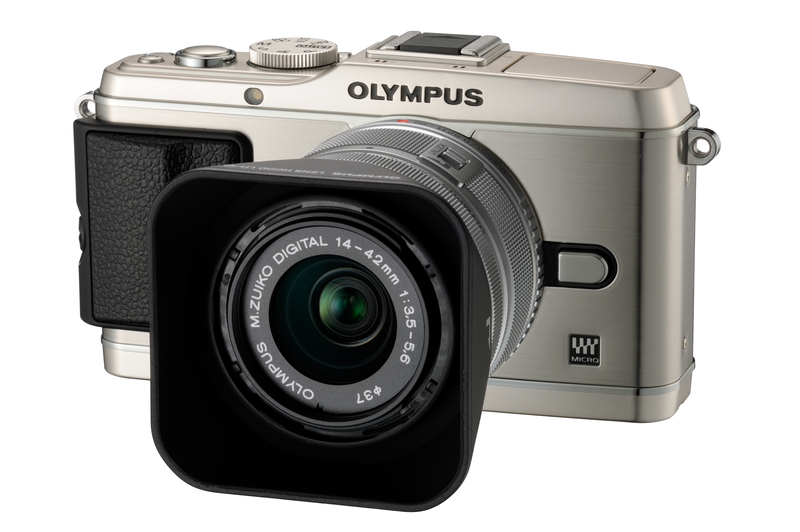 OLYMPUS PEN E-P3 is available at Olympus authorised retailers. Look out for Part II when I return with the specs for OLYMPUS E-PL3 . Olympus Imaging Singapore is the unparalleled industry leader in opto-digital technologies, delivering award-winning digital imaging products for the consumer and professional markets inSingapore. Driven by a strong commitment in providing innovative products and solutions of the highest quality, Olympus Imaging Singapore works closely with industry partners, customers and otherOlympusbusiness units in producing leading-edge products. These include analogue and digital cameras, professional SLR imaging systems, and voice recorders, amongst others. Olympus Imaging Singapore’s unrelenting efforts in superior customer service also bear testimony to its brand promise of delivering the best user experience to all consumers and professional users in the imaging field. For more information, please visit http://www.olympusimage.com.sg. This entry was posted in Brand: Olympus, Photography Articles & Videos and tagged DSLR, Lens, Micro 4/3, Mirrorless, Olympus, Zuiko. Bookmark the permalink.